A tribute to the recently-deceased drummer of The Stooges, featuring originals and covers. Blues guitarist Hadder Sayers is interviewed during an all-Texas show! 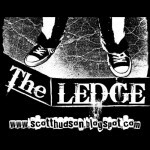 It’s an expanded episode of Live Ledge this week, as Hudson plays tracks from his “40 Best Albums of 2012″ list. Having missed a few Rural Ledge timeslots, new material has piled up. Today we preview quite a few of them. A new jukebox and a pile of new releases inspires this week’s show!